1901 Thomas Edison's "Black Maria" film studio, often called America's first movie studio, was closed, and it was demolished two years later. In its place, Edison built a new movie studio in NYC - it was the nation's first indoor, glass-enclosed studio that could be used year-round. 1901 The U.S. Circuit Court recognized Edison's motion picture patent-infringement claims in his lawsuit against the American Mutoscope & Biograph Company, which appealed the decision to a higher court. 1901 The 25th US President, William McKinley, the first President of the 20th century, was the first US president to be extensively photographed and captured on film. His first inauguration in March of 1897 was the first to be photographed. A short news-film shot by Edison's Manufacturing Company, was taken during an appearance at the Pan-American Expo (Buffalo, NY), titled President McKinley Reviewing the Troops at the Pan-American Exposition (1901), one day before he was assassinated. 1901 Pathè released director Ferdinand Zecca's short film The Story of a Crime (aka History of a Crime or Histoire d'un crime), with two notable features: editing through a dissolve transition, and the (first) use of a flashback in a film to develop a non-linear narrative. A crime was envisioned in a progression of scenes - a Burglary, Murder, and Arrest. The imprisoned French criminal, while sleeping in his cell and awaiting trial, envisioned his family seated at their evening meal (the vision appeared on the wall of his cell). When he awoke, he was led away, quickly tried, convicted, and prepared for execution in the last scene. (During showings, women and children were allowed to leave before the final scene.) He was promptly guillotined - and then his decapitated body was pushed into a coffin. 1901 Director Walter R. Booth's short British film Scrooge; or Marley's Ghost (1901, UK) was an adaptation of Charles Dickens' perennial Christmas tale (apparently the earliest existing adaptation of Dickens' work on film), only half of which survived. 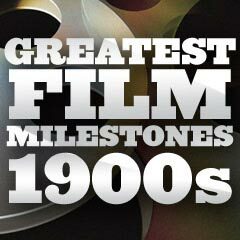 It was the first film to use elaborate inter-titles. It was also one of the first films to use of an upward transitional wipe for a scene change. And it was notable for some trick photographic effects -- the superimposition of Marley's face in a black oval over the door knocker, and the scenes from Scrooge's youth seen over a black curtain in his bedroom.